If competition brings out the best in people, why do some physician owners of surgery and radiation oncology centers settle for less? 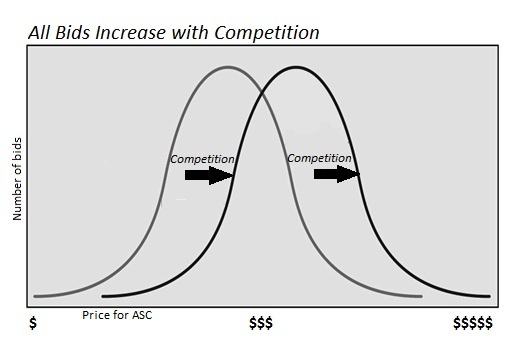 Whether it’s on the football field, on the track, in business, or to purchase your ASC, when we are forced to compete we are forced to do a better job than we would otherwise do if there were no competition. The bar rises and we compete at a higher level. Using this idea to your advantage is key to answering a question people ask me all day, every day: “what is my center worth?” It’s a complex question, and one that’s usually asked with a hefty dose of anxiety. Unfortunately, no one can ever give an automatic answer. We only know that your ASC or radiation oncology center is worth as much as someone is willing to pay for it. That’s why I recommend ASC owners use a professional methodology to efficiently get their center in front of an optimum selection of competitive buyers. I may be as smart and experienced as anyone in this business, but no amount of theory, no studying of discounted cash flows, comparable sales data or fair market values, no sitting through exams for the prestigious FINRA Series 79 investment banker exam, can give one person the “correct” answer for what a specific ASC is worth. Don’t get me wrong, I’ve done all those things, and I, just like any potential buyer you’d talk to, can come up with some number, but there’s no way to know whether that’s the highest and best number. Each buyer you speak with will come up with a different number based off of what is best for them. Therefore, it’s always disheartening to see an ASC owner settle on negotiating with one buyer and limit themselves to whatever number that one buyer works up. Rather, they should request bids from multiple buyers and multiple buyer types. As the offers come in, the whole group will be roughly distributed along the Normal Bell Curve [see illustration]. That is, a few purchase proposals will be notably lower than the rest (a small number of bids toward the left side of the curve), most will be close together around the average (a large number of bids in the fat middle of the curve), and importantly – you will receive some that stick out higher than the rest of the pack (the right side of the curve). But in order to see this phenomenon at work, you must start with a broad group of buyers. If you only get one offer, it could be anywhere. It could be the worst! If you only get two prices, they could both be on the low end of the curve, or one could be average and one could be low. In that case, you’d end up settling on an average price, leaving a lot of money on the table. The only way to know you’ve found a good buyer for your radiation oncology center, one who’s offering you the best price and terms for your ASC, is to compare that buyer’s price against a broad population of other ASC buyers. Statistically speaking, you have more certainty you’re picking the premium price and terms if you’re looking at a larger population of bids. In order to get this large population without exposing yourself to the mess of a public listing, you need a negotiated bid solicitation process. Some people call it a silent auction; in fact, that’s what the big-box investment bankers do. In the ASC space, I prefer a modified version where we actually call the potential buyers to discuss their interest. In practice, each buyer and each seller has a ‘zone of agreement’ where you believe the “value” of your ASC is. We will actually be working to not only select the bid with the highest ‘zone of agreement,’ but also to land in the highest part of this zone once the negotiation process is complete. For the purposes of understanding the process, think of getting one price from each potential buyer. The interesting thing about soliciting multiple bids at one time is that not only will you gain more knowledge about what your ASC or radiation oncology center is worth, but you will also spur better offers from individual buyers. In certain environments, just knowing that other buyers are out there competing for an ASC will encourage potential buyers to put their best bid forward. Therefore, competition itself serves to shift the entire normal curve of the solicited bids’ distribution to the right (toward higher prices). In an environment where every bidder thinks he’s the only bidder, the lowest price in the distribution will be lower, the average price will be lower, and the highest price will be lower than what you would see in an environment where every bidder thinks he has to outbid the competition. This is a very important fact you want to take advantage of when you think about how you’re going to place your ASC on the market. When a buyer approaches you, he will want to work with you one-on-one in that mythical environment where he is the only bidder. To maximize your opportunities, you should take the approach to be a signal of your ASC’s desirability as a potential acquisition, and then you can leverage a broader population of bidders to your advantage. At the end of the day, your center is worth as much as someone will pay for it. Therefore, selecting the correct buyer is crucial. Different buyers will come up with different valuations because they will either use the data that they desire or have different capital requirements or sinking funds, but the best buyer you can find is the one who is the most motivated to purchase your specific ASC or radiation therapy center. To that buyer, your ASC will not only have its own intrinsic value based on its projected future revenue, but it will also have strategic value because of its potential to “play well” with other holdings and create even higher profits in the future. Even some private equity groups (PEGs) or new management companies that are hot for a platform are more motivated than the ones that have been in the market of buying and selling ASCs. These buyers will work to be at the right edge of your normal curve, and if you can tap into the motivation of that buyer and get them to submit an aggressively competitive bid, all the better for you. The buyers’ full time development staff is trained to maximize their investors’ profits, essentially by buying low and selling high. This means they want to obtain your ASC below its market value, and astoundingly, they’re able to do it a lot of the time. They do it by trying to keep you from discovering what your market value is, that is, by keeping you from accessing a broad population of bids. I’ve seen many radiation oncology physician owners talked into no-shop clauses (agreements that lock the seller into only negotiating with one buyer for a certain length of time), because they think they’ve invested so much time and emotional energy with one buyer, and they’re afraid to lose one opportunity even if the potential gain is greater. It’s the classic ‘sunk costs’ dilemma – people are more fearful of losing what they have (or perceive they have) than they are of not acquiring a potential gain. In reality, a well-managed negotiated bid solicitation process will give you access to a broad group of reasonable potential buyers. Getting familiar with the acquisition industry and what motivates its players – price, synergies, professional packaging, risk aversion, etc. – will help you select a buyer to work with, and it will help you negotiate with that buyer. The key to the process of selling your ASC or radiation oncology center is to research and be prepared because this is not a learn-as-you-go process, nor should you get your research from the buyer. Rather, you should expertly put your center in front of a broad population of potential buyers in a negotiated bid process. Remember: competition brings out the best. It will increase your chances of finding the best buyer and obtaining premium purchase proposals. Working through the process correctly should not only optimize your selling price, but also reduce your anxiety at the same time. Ultimately, how you run the sales process for your ASC or radiation oncology center will make a difference in the final question of how much you get for it. Disclaimer: This paper is not intended or offered as legal advice. These materials have been prepared for educational and information purposes only. This paper is not legal advice or legal opinions on any specific matters. No person should act or fail to act on any legal matter based on the contents of this paper. This paper was not written by an attorney licensed in your state. Those seeking legal advice or assistance should contact an attorney.